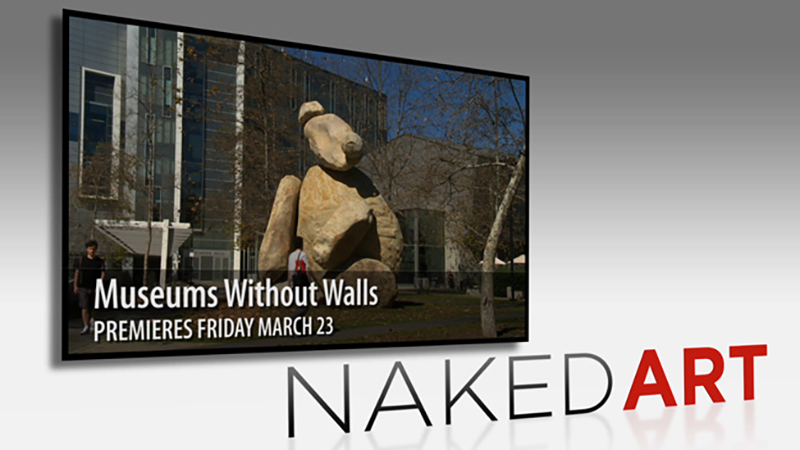 Today’s premiere of “Naked Art: Museums without Walls” concludes the inaugural documentary mini-series for our new YouTube original channel, UCTV Prime. After traveling to three different UC campuses and talking with artists, curators, faculty, students and others who helped make each of the campus’ public art collections a reality, we like to think we’ve shown our growing YouTube audience the range of personalities, sensibilities and landscapes contained within this distinctive research university that spans ten campuses across the state. The final installment refelects upon the diverse definitions, purposes and modes of public art from UC campuses and elsewhere, and includes comments by artists, curators, students and other participants in the “Naked Art” series. Taken together, the four-part series just might open your eyes to the works of art that cross your path nearly every day. More importantly, “Naked Art” offers just a taste of what we’ve got in store for you this year on UCTV Prime, starting with “Prime: Vote,” a series about issues in the public debate during this important election year. The series launched last week with three thoughtful commentaries by UC faculty. Then stay tuned in April for the seven-part miniseries “The Skinny on Obesity.” If you’re a fan of UCTV, then you’ve probably seen or at least heard of UCTV’s popular video lecture “Sugar: The Bitter Truth,” featuring UCSF’s Dr. Robert Lustig on the damage caused by sugary foods. With over 2 million YouTube views to date, the video has become a viral sensation, sparking TV news stories, newspaper articles, even spin-off books by YouTube fans. UCTV Prime decided it’s time to dig deeper into not only the dangers of sugar and its substitutes, but what the latest research is telling us and why it’s changing everything we thought we knew. You won’t want to miss it when it premieres April 13. And there’s plenty more to come, so if you haven’t subscribed to the UCTV Prime YouTube channel yet, do it today! In the meantime, enjoy these final thoughts on what it means to leave pieces of art out in the wild. There’s nothing quite like the Stuart Collection, an eclectic collection of site-specific art sprinkled about the UC San Diego campus, featuring works from some of the leading artists of our time. A massive teddy bear made of precariously leaning boulders. Talking trees. A house “crashed” atop a seven-story building. It’s not just art — it’s engineering. We talked to Mathieu Gregoire, the Stuart Collection’s project manager featured in “UCTV Prime: Naked Art,” about the process of turning an artist’s imaginative concept into a tangible work of art. You’re an artist yourself. What led you to your work with University of California’s public art collections? I have always liked to think about how things fit together, and about the mechanics behind illusions. Even though the works in the Stuart Collection are all quite real and factual, they are also all in some sense illusions, and they change over time even as they remain the same. After a while, I became interested in the way ideas can be illusory. Many of the projects have been realized because it was possible to fit things together not only mechanically but also conceptually, beginning with the proposals. You’re involved in the hands on installation for the Stuart Collection. Some of the pieces seem like they’d be particularly challenging. Which work was the most difficult to negotiate and why? I cannot think of one as most difficult. Each has had difficult moments, because each is an experiment. The problems have usually come from the one-off nature of each piece. Because the big projects have been the most carefully designed they have actually been less difficult in some ways. Fallen Star, the latest piece in the collection that involved constructing a house and placing it atop a building at a precarious angle, is probably one of the most audacious works in the Stuart Collection. Was there ever a point where you thought, no way? This won’t work? That was a possibility, but for some reason I didn’t worry about it. Fallen Star is physically audacious, but other seemingly subtle works have their own audacity. Fallen Star seems to playfully melds art and engineering. The Bishop Collection at UCSF Mission Bay (premiering March 16 on UCTV Prime), which you also facilitated, does the same with science and art. Do you think the days of traditional public art collections are over? These two UC collections are quite unique and they don’t “playfully meld” so much as they contradict expectations about public space. I wish things were changing, but the future of “public art” in the real world outside these unique situations is committee-driven and does indeed tend to be inoffensively melded: this is the traditional public art of today, and it is becoming more entrenched. As an artist, you’ve worked on projects commissioned by public agencies. What is that process of art meets bureaucracy like? I don’t think the two can meet, but they can exist in spite of each other. Bob Irwin uses the metaphor of the Lindy for this kind of coexistence – a dance that involves gliding past and over and through each other. The norm is for art to be subjected to bureaucracy, resulting in bureaucratic art. It’s possible for the art to dictate its own terms and the bureaucracy can take it or leave it – the way a Richard Serra is commissioned is like this. The third way is where the two glide past each other, which has been possible with the Stuart Collection. What’s your favorite work in the Stuart Collection? Why? No way! The best part about it is that they are constantly changing in my memory as well as my present experience. And each one of them was a surprise in its realization. If I had to choose I would pick the Michael Asher and the Nam June Paik, for their pathos, their connectedness and because they seem in some way courageous. David and Goliath. In your travels off campus, what works of public art have made the strongest impression on you and why? One from the 20th century is Jean Tinguely’s Cyclop, a giant head in the woods south of Paris. Another, from 1000 years earlier in the 9th century, is the Mausoleum of Ismail the Samanid near Bukhara, in Uzbekistan. There are many in between! In most cases with these works that have made a deep impression on me, the interior space has as strong a presence as the exterior. And they were initiated by one individual yet realized by the work of many – I guess I like that.